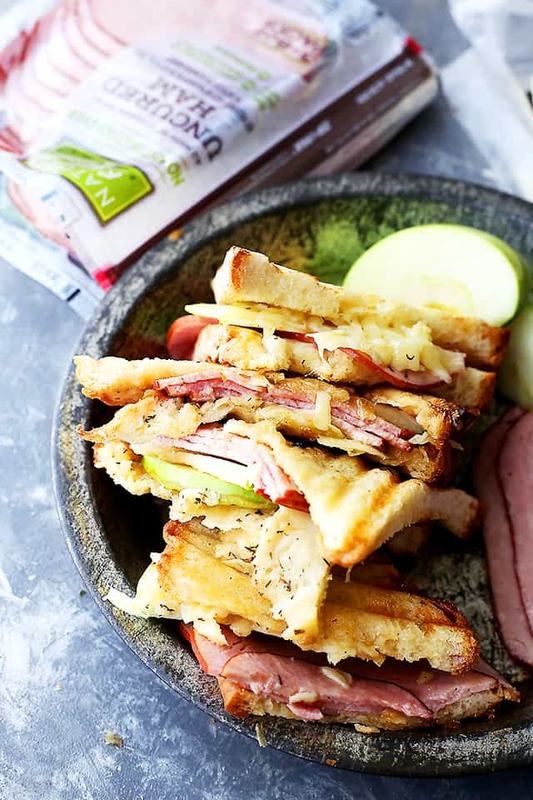 Diethood » Home » Ham and Apple Grilled Cheese Sandwich + $50 Sam’s Club Gift Card Giveaway! Thank you, NatureRaised Farms®, for sponsoring this post. The opinions and text are always 100% my own. 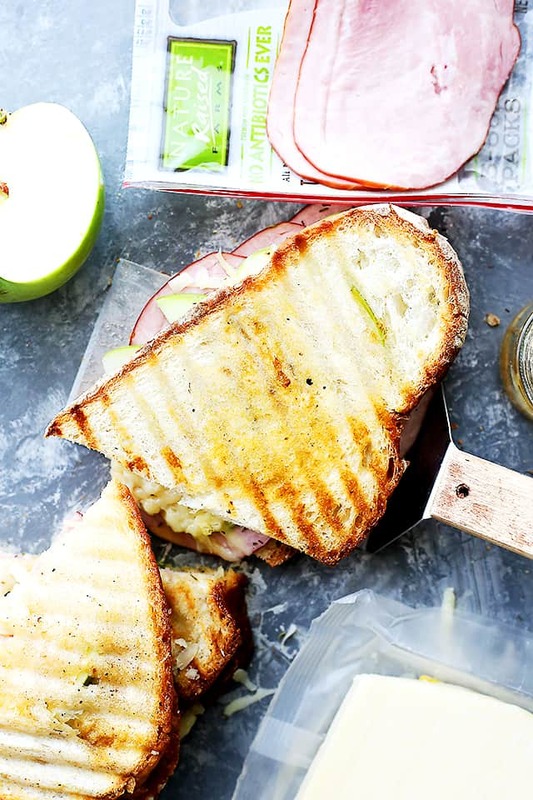 Ham and Apple Grilled Cheese Sandwich – Transform the classic grilled cheese sandwich with a perfect combination of flavors and textures including apples, ham, and gruyere cheese! Howdy Hey! It’s Friday and I made you a warm and flavorFUL and melty grilled cheese sandwich today! Also known as *theeeee* sandwich that I will serve leading up to AND in between the Holidays. Also, after school and sometimes during lunch… dinner, too. I think we’ve already talked about this, but my favorite thing in life, during this time of year, is flavorful and quick, but comforting and delicious, quick snacks and meals. And even though I adore 5 course meals and candlelit dinners, sometimes, nothing else can hit the spot like a good ol’ grilled cheese can. What will you make with NatureRaised Farms® Uncured Smoked Sliced Ham? Tell me in the comments section below for a chance to win a $50 Sam’s Club gift card! I’ve been trying to come up with something that I might be able to serve the day before we feast on that turkey, or even the day after. Something easy, something quick, and something good. With all the people coming in and out, and with all the conversations that will take place around the couch, I don’t want to be stuck in the kitchen missing all the fun. Besides, I want to avoid a FOMO episode at all times. I’m picturing a feast of sandwiches in the living room while we all talk and watch the game. I don’t know which game, but any game will do! While going back and forth with my thoughts, I arrived back at this awesome Ham and Apple Grilled Cheese Sandwich and heard the angels sing. Let me just try to describe this sandwich to you without completely melting on ya. So when I came back home, I was inspired to make a sandwich with my newfound ham, some crusty Italian bread, lots o’ cheese, apple slices, and apricot jam. Grey Poupon, too! Let me tell you the beautiful truth: I made this in less than 5 minutes. Great recipes that are simple + quick + gorgeous in just minutes = my perfect life. This is real food for real people. In between the pumpkin pies and sweet potato casseroles, we gotta have something easy, yet cozy and yummy. Because I also want you to get your hands on this wonderful product, I am giving away a $50 Sam’s Club Gift Card!! All you have to do is tell me, What will you make with NatureRaised Farms® Uncured Smoked Sliced Ham? Tell me in the comments for a chance to win a $50 Sam’s Club gift card! For more information on where you can buy NatureRaised Farms® Ham, please go to eatgoodcleanfun.com. Spread jam and mustard over the sliced bread. Arrange ham slices over 4 slices of bread. Add sliced apples and mounds of cheese over the ham. Season with rosemary and close sandwiches with the remaining slices. Grill sandwich until golden brown on both sides. Do you have the nutrition information this sandwich? Hi! Very sorry about that! It should be there now. I love breakfast so I will make an omelet with the Nature Raised Ham, a wedge of Laughing Cow cheese and roasted cherry tomatoes. I make something similar to your sandwich. I toast half a everything bagel, then I turn on the broiler, put the ham on top of the toasted bagel, top it with apple and red onion, then I put sharp cheddar cheese on top and broil till the cheese is browning and bubbly. The apple and red onion marry together so well and oooooooh does it taste delicious!! I would make a creamy Ham and Potato Soup. Since it is so dang cold, I am all about the soups. Just found your blog and I LOVE IT. Your pictures are amazing, your recipes are simple, hardy and healthy and you are funny to boot. I would make a yummy twist on eggs benedict. Thanks for the chance! i would make baked ham and cheese sliders. I would make a ham, cheese and egg breakfast burrito – not very inventive, but super yummy! I would make some “cinnamon rolls”, except in place of the cinnamon and sugar, put ham and cheese. We make them whenever we have company over and they are a hit. Either that, or they are too polite to tell us otherwise!! I totally agree – quick, easy, and delicious is a must around the holidays! 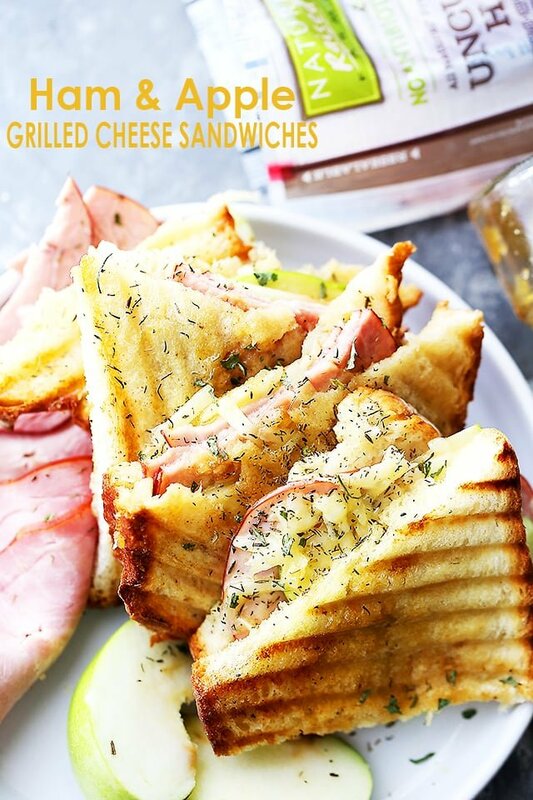 I would definitely make this ham and apple grilled cheese sandwich! Looks so delicious! I would make ham biscuits! I will make grilled cheese and ham sandwiches. Can we pause and talk for a moment about how seriously amazing this grilled cheese is? This is a fantastic sammie! Best sandiwch ever! Love it! Wow I’m so impressed with this sandwich. I’d love to take a bite right now! Grilled sandwiches are so good and yours is exceptional. Even that apricot jam adds another fantastic flavor that blends so well. I would make wraps with the ham by adding the meat, lettuce, tomato, dijon and cucumber. 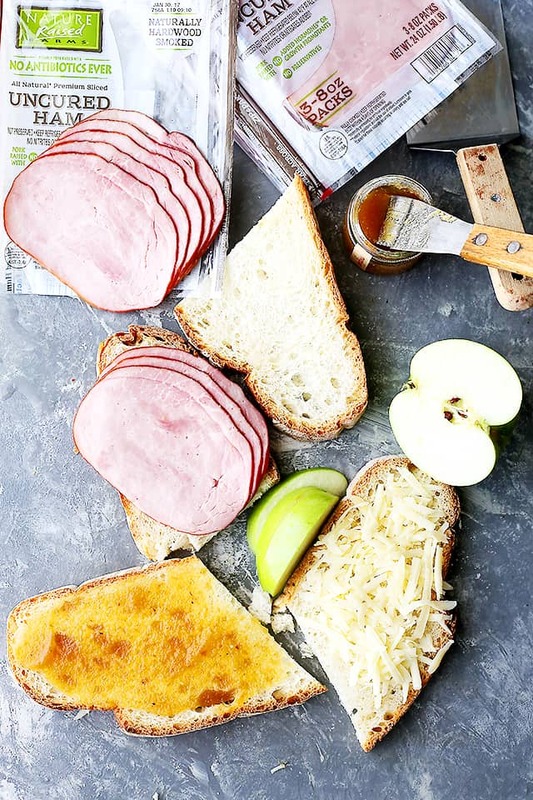 Ham, apple and cheese – one of my favorite sandwich combinations. This is a grilled cheese sandwich for the ages! I was just dreaming up a grilled cheese like this just the other day, but with turkey! Have you had the Panera Sandwich with turkey, apples and cheddar? it’s my fav, and I thought I might try it grilled! you’re sandwich has me drooling!! I would make a yummy breakfast casserole! Perfect for Christmas morning. I would make a Monte Cristo casserole for Christmas brunch. I need to try this! I love it! YUM! What an absolutely DELICIOUS sandwich! 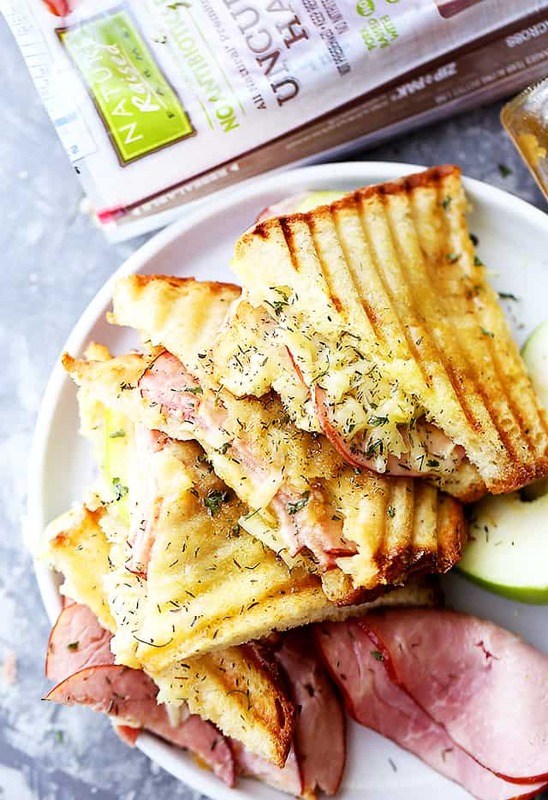 I love the addition of ham and apple to the classic grilled cheese, and I know my entire family will adore this combination of flavors. I think I would use the ham in ham and cheese omelettes. I love good ham with my eggs. After I make this recipe you’ve posted, I would make a Monte Christo sandwich. I’ve been thinking about making this: https://diethood44.wpengine.com/overnight-breakfast-strata-prosciutto-asparagus/, maybe I would sub in that ham! oh man, i could spend 50 bucks at sam’s in my sleep! i’d make a ham, cheese, and pasta bake–sounds really good right now! I need one of these fancy grilled cheeses! 😉 They look amazing! I would make breakfast sandwiches… ham, egg and cheese on a bagel or English muffin. On a cold wet night I like a toasted Ham and Cheese sandwich with a cup of tomato soup. Real comfort food! I’d make baked ham sliders. My nephews love them and ask for them all the time. I’d make an egg scramble with ham, cheese, onions and spinach. I would love to make a ham and cheese sub! my favorite! I would make ham and Swiss cheese sandwiches on rye bread. This recipe looks and sounds absolutely delicious. I think I would make a ham and gouda cheese Panini! Havarti and Ham grilled cheese, Eggs Benedict, and on rye with Smoked Gouda. Since I’m a breakfast fanatic, I love dicing ham into smaller pieces, then frying them up in a little butter. Add some fresh veggies, add whisked eggs and I’m left with the best omelette! This ham would be perfect for my mornings! 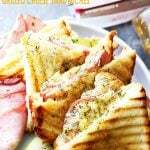 i would make a ham and cheese panini with some pesto mayo. I just got a new panini maker and I love it! I would make ham omelet. Dice the ham and add to au gratin potatoes made with gruyere! Big green salad on the side with any leftover ham cut into strips and added as well. YUM! I would make a Hawaiian pizza with the Nature Raised Farms Uncured Smoked Sliced Ham. I make it with the traditional ingredients plus caramelized onions, roasted macadamia nuts, unsweetened coconut, Swiss cheese and add a bit of BBQ sauce to the red sauce for a little zing. Oh, this looks so good! Maybe this first and then Ham Mac N Cheese! Well, as delicious as that sandwich looks, I think I will be making pinwheels with Nature Raised ham and 2 -3 of my favourite cheeses. Soo easy, sooooo delicious! I will make a ham sandwich. I would make Monte Cristo sandwiches! I like using ham for omlettes and over-easy egg sandwiches at breakfast. I just bookmarked a ham & scalloped potatoes recipes, so….that! I will use it in ham sald!! i will use it in my mac n cheese and some ham salad. This recipe sounds delicious! I love the idea of using apricot jam for a touch of sweetness and the dijon mustard for a bit of tang…..I must try it soon!! 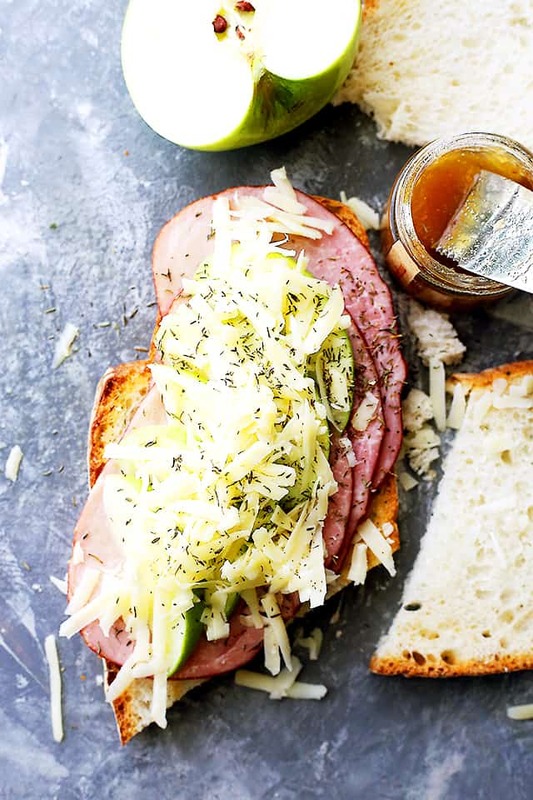 I have been on a ham and cheese kick myself, so (besides using NatureRaised ham for this sandwich) I would use the ham for a good old classic ham and swiss on a nice sprouted grain bread with a smear of garlic aioli mustard. Yum!